Home Anushree Reddy Bridal Fashion Shopping Top 10 Anushree Reddy Bridal Lehengas with Price || Where to Buy Anushree Reddy! Top 10 Anushree Reddy Bridal Lehengas with Price || Where to Buy Anushree Reddy! If there is one designer whose collection I always check out at fashion weeks it is Anushree Reddy. Her outfits have this dreamy feminine appeal which is totally drool worthy. The floral prints and fresh pastel hues are what distinguish Anushree Reddy from the rest of the bridal designers in India. If you are looking for designer lehenga for your wedding, mehndi or even sangeet you should definitely check out Anushree Reddy's latest collection. Anushree Reddy gives you a bridal look which is feminine and her creations with their intricate work is sure to stand out. 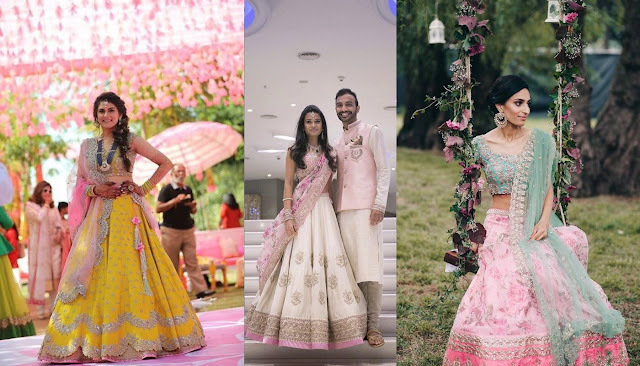 Lehengas from high end designers like Manish malhotra and Sabyasachi cost anywhere between 3-10 lakhs and comparatively Anushree Reddy can be considered very affordable as all her creations bill under 3 lakhs. So yeah under 3 lakhs can atually sound pretty expensive but if you want an authentic designer lehenga then you have to be ready to pay. Here in this post I list to you 20 gorgeous Anushree Reddy bridal lehengas with prices. Most brides still prefer red for their wedding. If you want to be a red bride then this Anushree Reddy lehenga is a perfect pick having a traditional look yet the scallop lehenga border lends a contemporary touch to it. The metal zardosi work beautifully enhances the beauty of this silk lehenga and I love how this is paired with a baby pink scallop edged dupatta to balance out all the bright red. You could go with a single dupatta or add another dupatta in a contrasting shade for a stunning bridal look. 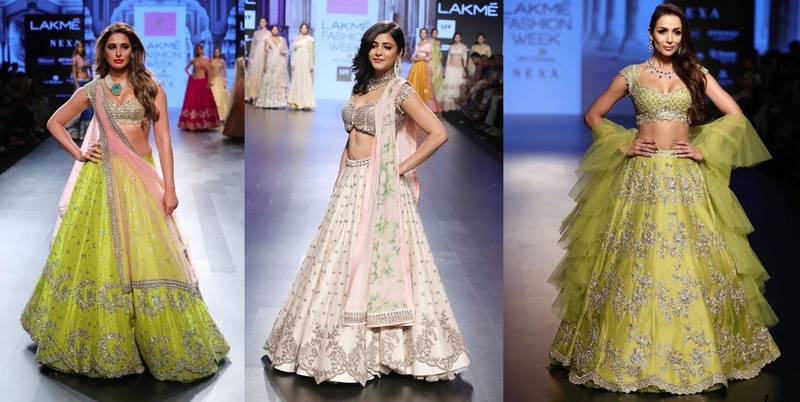 Fresh shades with delicate work and scallop edges are an Anushree Reddy signature. If you want a bridal lehenga in an offbeat colour pick this stunning yellow lehenga which is comes with an embellished blouse and a plain ruffled net dupatta. This amazing ue is sure to stand out at a day wedding and when paired with a contrast double dupatta it can make for a stylish bridal look. If light printed lehengas with a chic vibe is what you are looking for then this pink lehenriya lehenga is a perfect choice. The printed lehenga is adorned with embroidered chand bali motif giving it a very unique twist and the gold blouse add the required bling a bridal lehenga demands. Brides rarely wear white or black at weddings but things are changing these days and pastel hues have become the most popular bridal trend. If Anushka Sharma can make for a stunning pastel bride even you can make a statement in an embellished white lehenga. This lehenga is especially striking because it comes with pale pink floral dupatta perfect for spring summer wedding. You can also wear this lehenga for your Mehndi event. Anushree Reddy designs can easily be identified and distinguished from an array of designer wear. 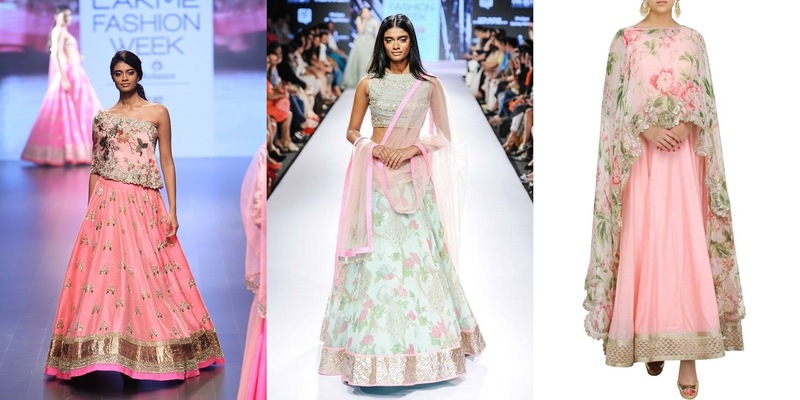 Dreamy prints and soft and sorbet colours are an Anushree Reddy trademark. This Pink and ice blue lehenga worn by show stopper Nargis Fakhre is an exquisite bridal lehnga which is all things pretty and chic. If you want to experiment just a wee bit then a paneled multi green lehenga with embellished blouse and pink net dupatta can fit the bill. The dupatta has the trademark scallop hem and the lehenga is super breezy and light making it a perfect pick for destination weddings. You can flaunt this lehnga at your sangeet, mehndi or even reception. Whether you are a bride looking for a budget under 50k lehenga or a designer lehenga, pink and red are two colours which will always remain a hot favourite on your list. Most brides these days try to steer clear of red to look different when it comes to bridal lehenga but this amazing pink lehenga has red in alluring bits making it a popular option with brides wanting a traditional look. I have this advise for brides always, go traditional for the wedding and contemporary for the reception. Here you have a pink lehenga with pale pink net dupatta and a red blouse with a huge red patti border rendering it a very fashion forward vibe. The colour play in this outfit is beautiful yet not offbeat. If you are looking for a bridal lehenga in a unique hue then look no further. This Anushree Reddy bridal lehenga in mustard yellow shade is an absolute favourite of mine. The semi sheer blouse adds a flirty edge while the trendy colour is the real highlight. This bridal lehenga is for brides who want an interesting bridal look without leaving your comfort zone. Experiment with colours instead of silhouettes if you want to play safe and traditional. Grey is another trending colour this season. This may not be your ideal hue for a bridal lehenga but for for an event like sangeet or even a reception this Anushree Reddy lehenga is an amazing pick. The colour is a statement in itself but what adds to the charm of this outfit is the gorgeous scallop edge dupatta, semi sheer blouse and a floral border on the lehenga. If you have beach destination wedding then this lehenga looks like a fabulous choice for a striking bridal look which is sure to get people talking about your bold and fearless sense of style. Bright red and romantic pink come together to give you a stunning bridal lehenga. This lehenga has metal pitta work and silver sequins to make you look glam and gorgeous on your big day. The lehengas we listed in the beginning with price are slightly higher on budget because they are bridal lehengas. If you want to wear Anushree reddy for smaller function then Anushree Reddy actually has a lot of under 1 lakh options. Anushree Reddy is the most popular designer for mehndi functions as florals and pastels go well with the laid back mehndi ceremony vibe. Many celebrity brides like Bipasha Basu also have worn Anushree Reddy creations for their own mehndi ceremony. These lehengas also make for gorgeous sister or bride or groom outfit options. Which of these Anushree Reddy bridal lehengas do you like most? With designer wear it is best to check the final look and but offline in stores. Anushree Reddy is based in hyderabad but her creations are easily available across major cities in India at multi designer stores. Anushree Reddy lehengas are available at Oogan, ensemble, Aza and evolutionize stores. Anushree Reddy is can be brought both online and offline . I suggest you research and zero down favourites online and then head to any offline stores which stock Anushree Reddy designer outfits. At the store you can do a trial and then make your final order. Here is the complete store list. Where to shop Anushree Reddy outfits online? To shop Anushree Reddy collection online visit Jiva Couture , Couture Yard, Aashniaandco or Aza at their websites. Some of these stores also ship internationally.